Every year around this time I start stocking up on gift wrap supplies – and creative gift wrap ideas. I save random bits of string and ribbon that come on packages. I keep the pretty tissue paper that comes in the clothing purchases, and basically keep my eye out for any cool looking paper I see lying around. Sometimes it’s a newspaper that has managed to only be black and white – no colored ads for the cheapest sofa’s around or giant pictures or weird and scandalous people of interest. Sometimes it’s a 95% used up roll of butcher paper at my office. What I’m getting at here, is that I throw stuff together for wrapping haha. I always have to bring my gifts on the plane in my carry on which usually makes for a precarious wrapping scenario. Do I wrap it beforehand so no one sees their gift and hope it doesn’t get smooshed or torn up by TSA? Do I add bulk to my luggage by bringing all of the supplies separately and wrap everything once I get there? The answer is a combination of both. I usually go ahead and wrap the boxes, leaving off any extra decoration like ribbons or gift tags (I make a note on the bottom so I’m sure to remember who’s gift is who’s – forgot that one year and ended up unwrapping and re-wrapping the gifts.) This saves me some trouble when I get there because no one can snoop and see what I’ve gotten them. Then, once I have arrived, I add the fun stuff! 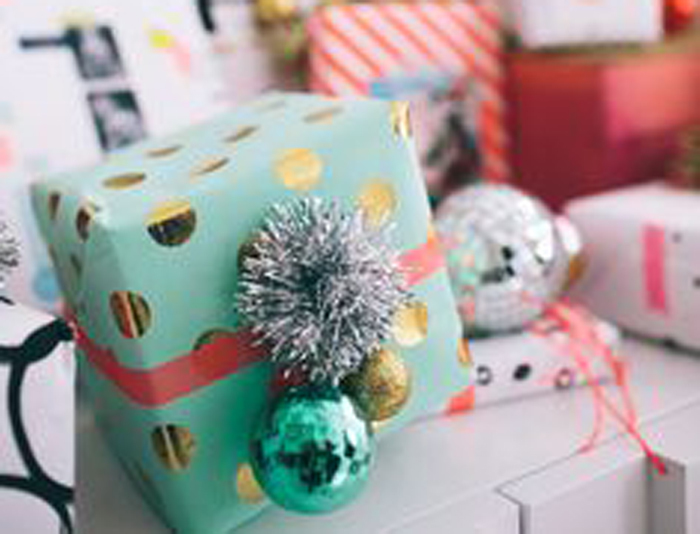 Check out some of my favorite gift wrapping ideas from around the web below. P.S. there are loads more over on my pinterest. Skip the stockings and put the stuffers on your gifts as extra prezzies! Click here to see more on DesignLoveFest. Go to your closest thrift store and pick up some old maps or sheet music and voila, cool wrapping paper! Click here to see more on DIYs.com. If you are artistically inclined, just draw everything on. I actually really love this! There is nothing to smoosh or tear or lose. Click here to see more from Going Home to Roost. Use a scarf as the paper and AGAIN extra prez! Click here for more reusable gift wrap ideas from Inhabit. Get nice boxes in the first place. When you are using really nice boxes, you need pretty minimal decoration. I like the way they doubled up on the gift bow, makes it look super nice without too much fuss. Click here to see more simple gift wrap ideas from The Decoist. Instead of finding the most transparent tape possible in hopes of no one noticing it…use washi tape or other fun tapes as added decoration. This one gets extra points because it’s super travel friendly. Click here for more gift wrap ideas on DesignLoveFest. Put a sticker on it. Like everywhere on it. Leave no space un-stickered. Get more super easy and affordable gift wrap ideas from Dollar Store Crafts here. This is such a fun roundup. I always want to wrap everything all pretty, but never have time. I’m pretty sure the fact that I haven’t even begun to think about Christmas gifts yet is directly correlated to this problem. Love all of these DIYs! I wasn’t too creative this year with my wrapping. You are definitely not alone on that front, haha! !